McToad likes Thursdays. Why? 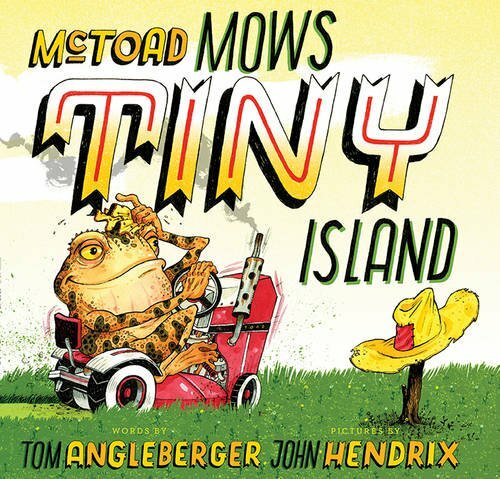 Because on every other day of the week, McToad mows Big Island, but on Thursdays, McToad mows Tiny Island. 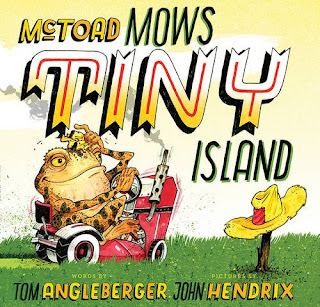 To do so, he puts his mower on the back of a truck, which drives to a train, which goes to a helicopter, which flies to a boat, which uses a crane to put the lawn mower onto Tiny Island. There McToad mows and drinks some lemonade, and before you know it, it’s time to turn around and go back home. It's complete and utter nonsense in the silliest way possible—but what else would you expect from Tom Angleberger? Basically, it's hilarious, and storytimes everywhere are going to love it. For me, the lack of a real story made it four stars instead of five, but don't let that stop you from enjoying it. It still has a great pattern in text (perfect for a readaloud) and a thorough rundown of transportation vehicles. But what's even better? The illustrations. Hendrix made sure each page was rich with detail and some hidden jokes--and, I might add, some mighty fine hand-lettering. Even the end pages are fantastic. For the vehicle-loving tot or for the librarian looking for another fun storytime readaloud, this is a definite must. Really, just everyone should at least give it a read-over.